Let me start this presentation by saying that I am not a die-hard PANTERA fan and in fact, I do remember looking the other way when this US band was hitting big numbers in the Metal market. Yeah, I was kind of young but still I had the feeling that all this hype was too much. Anyway, the truth is that PANTERA made a huge impact in the Metal scene (especially in the US) and sadly have their name connected to one of the biggest tragedies in the recent Metal history. There was a lot of turmoil surrounding the shocking death of Dimebag and as it usually happens, the rumors created around this event multiplied like mushrooms in a rain forest. Suddenly there were too many people knowing the true story but for some strange reason they did not agree with each other. I think the persons who actually have the right to tell the story as close to the truth as possible are the ones who were in close proximity with the band. 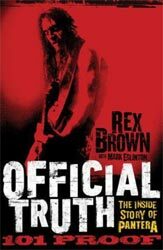 One of those is Rex Brown, the bass player of PANTERA who joined the band during the Hard Rock (or maybe should I say Glam?) days. 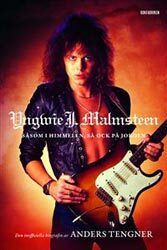 How can you really fail writing about Yngwie J Malmsteen and his career? Not in this world, even if Yngwie himself isn’t a part of the work. No, that’s correct. “Såsom I Himmelen, Så Ock På Jorden” (freely translated to; “As In Heaven, So On Earth”) is the unofficial biography of Sweden’s most Rockstar throughout time. For the Swedes author Anders Tengér is a well-known face; he’s been working on several different magazines and was the founder of the biggest one in the 80’s, OKEJ. And this is what he has used here; his connections from his career as well as putting in a lot of effort digging up a lot of information about Yngwie J Malmsteen.